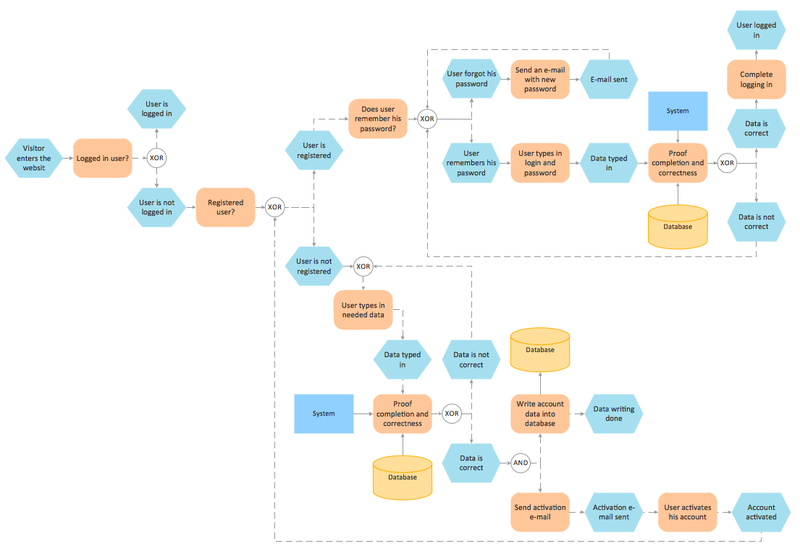 “An Event-driven Process Chain (EPC) is a type of flowchart used for business process modelling. EPCs can be used for configuring an enterprise resource planning (ERP) implementation, and for business process improvement. Usage for control of work share with instances of autonomous workflows in workflow management is possible, but not yet implemented. How do you make usually the EPC diagrams? It is quite complex and lengthy process. 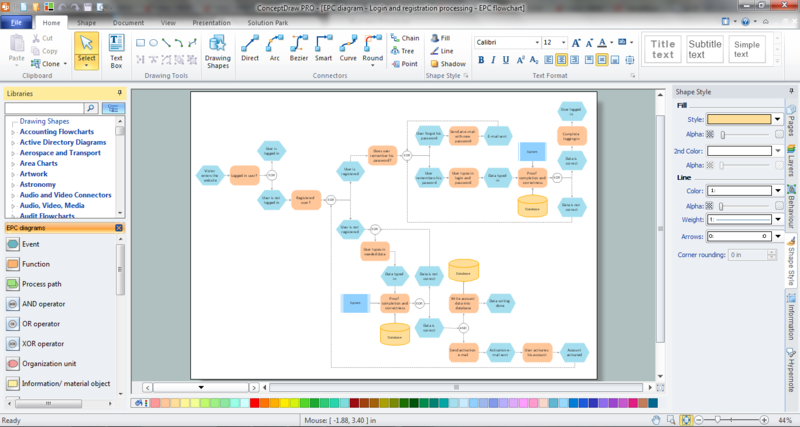 But now thanks to the ConceptDraw DIAGRAM diagramming and vector drawing software extended with Event-driven Process Chain Diagrams EPC solution from the Business Processes area of ConceptDraw Solution Park this process became simple and fast. Event-driven Process Chain Diagrams EPC Solution offers a set of predesigned templates and samples. You can choose any desired EPC diagram sample from the offered in ConceptDraw STORE that meets your requirements and change it for your needs. Use also the predesigned vector objects from the EPC Diagrams library to design your own EPC diagrams from the beginning, or when you fill the ready template or change sample. This sample was created in ConceptDraw DIAGRAM using the predesigned objects from the Event-driven Process Chain Diagrams EPC Solution. This EPC diagram shows in details all steps of a login and registration processing. An experienced user spent 20 minutes creating this sample. All source documents are vector graphic documents. They are available for reviewing, modifying, or converting to a variety of formats (PDF file, MS PowerPoint, MS Visio, and many other graphic formats) from the ConceptDraw STORE. 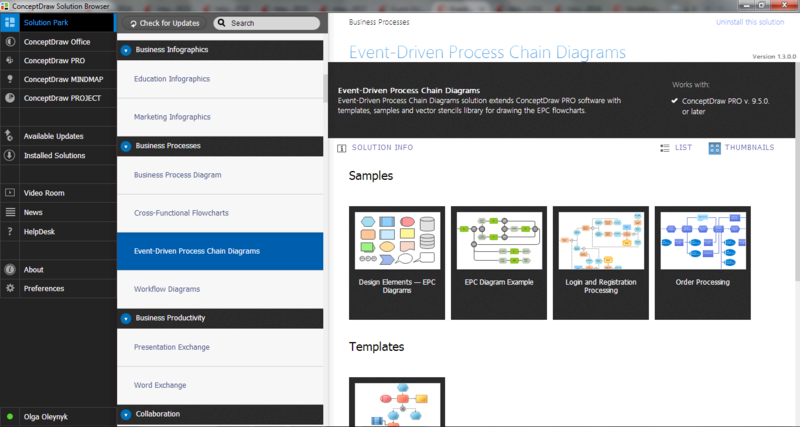 The Event-driven Process Chain Diagrams EPC Solution is available for all ConceptDraw DIAGRAM or later users.